The ASC service area is divided into "Grid Areas". Each "Grid Area" is approximately five (5) square miles. 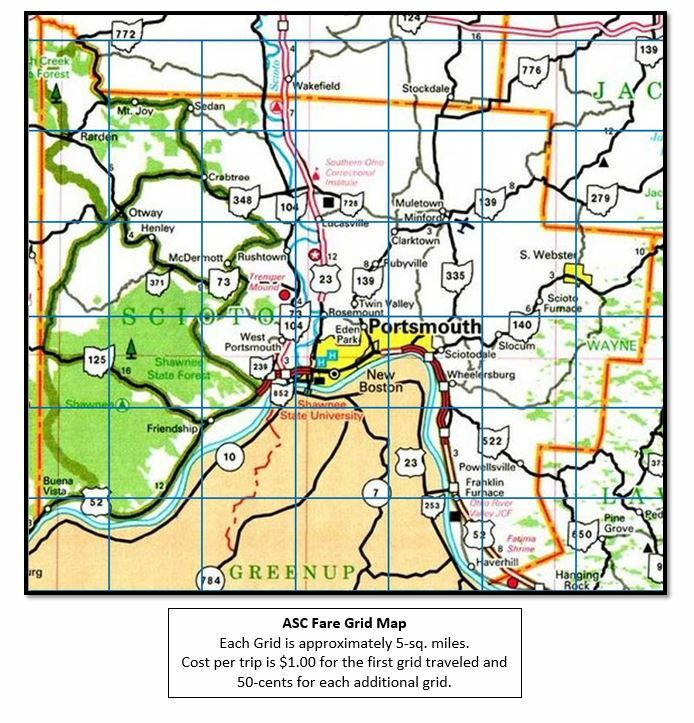 Each one-way trip costs $1.00 base fare for the first initial "Grid Area" traveled and 50-cents for each additional "Grid Area" traveled. ​To find out the exact cost of a trip between two points in the service area, please call the ASC office at 740-353-5626, ext. 203. Passengers at least 65-years old, disabled, children 12 and under, and U.S. Military veterans are eligible for a reduced fare. The reduced fare is half price of the regular general public fare. ​For more information or to apply for a reduced fare, please contact the ASC office at 740-353-5626, ext. 203.